Another early start with too much luggage. Checked in for 06.15 flight to Brussels & onward to Freetown, arriving at 6pm. Met at airport to drive straight to Bo. Night driving was tricky, blazing on-coming headlights, destination Bo at 12.30 am – shattered!! 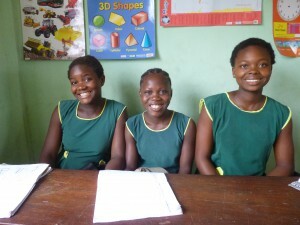 School is as fantastic as ever, with the new Junior Secondary 3, we have 380 pupils on roll. Greeted by smiles and laughter. 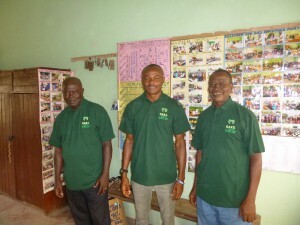 New Teachers – Augustine, Mathew and Solomon. Wearing their new OAKS polo shirts. I met our three new teachers, they all seem to like OAKS after only one month in the job. Mathew told me it was like finding his other family, he loves the camaraderie. 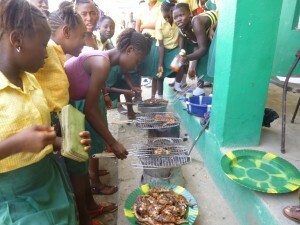 Big problem in the registration of Junior Secondary for their BECE exam in June. Despite our very best efforts we still have no Index Number. This means we have to sit the exam under another schools colours and pay for the privilege! So my first job is to visit the Deputy Director of Education to review progress with this matter. We have tried everything for a period over three years – letters and personal visits to all the educational agencies involved, but nothing seems to work. Our Department for International Development (DFID) in London and Freetown has been bombarded with requests for help. Recently via The Minister for International Development, Justine Greening, we now have a contact at DFID Freetown. Sally Taylor rang me twice whilst I was in Bo. Her initial meeting with Education at Freetown has led her to believe registration is a nationwide problem and she will raise our case, however, in all probability it will still take much time to resolve. Joe, OAKS Head teacher is going to try to arrange a meeting with the Vice President of Sierra Leone, Victor Fou, who has a residence in Lewabu, just over the swamp from us. An introduction to him may help. Will he, or won’t he visit Bo whilst I’m here? I carefully unpacked the precious science equipment donated by Clare Mount and Ridgeway High schools, Wirral. I really wasn’t sure how they’d travel in my suitcases, would I be greeted by a pile of broken glass? Hurray! 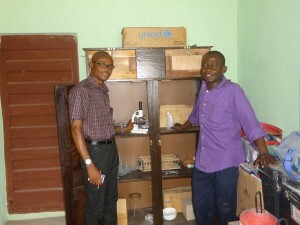 An excited Patrick, wow, science equipment. Joe, the Head, equally impressed. All intact. Patrick Goba, the science teacher was duly overwhelmed and speechless. We’d had a new cupboard made last term which has proved surplus to requirements, so we had a ready-made designated housing which is now installed in the storeroom. See how pleased Mathew & Patrick are. I made an appointment with Bo Education for the following day. Unfortunately, despite the best efforts of the Deputy Director, there is still no registration number for OAKS Junior Secondary. This is not personal, many schools are suffering; the system is just not working. 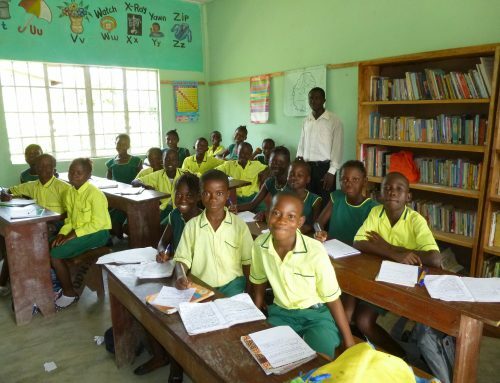 Questions about the burgeoning backlog of work at the Department for Education, particularly for the approval process of expanding or new schools has even been raised in Sierra Leone’s parliament. Mr Swaray as way of compensation, I suppose, invited our Head teacher to present himself at the Education Stores for a supply of new materials. Supplies from the Department of Education. A new school year & not a text book in sight! Wow, some text books! Alas ……. 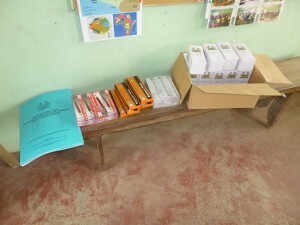 it was pens, pencils and registers, but, welcome supplies non the less. On a happier note, the same day, the Primary school received a visit from Bo Eye Hospital and all the pupils had their vision checked. Some children were given referral appointments. I travelled from the Department of Education in Bo, just around the corner to Bo Methodist High School. 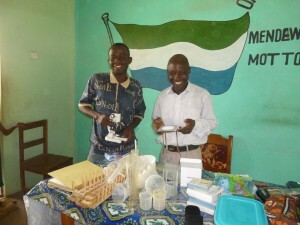 Here I met Patrick our science teacher for an appointment with the Principal. 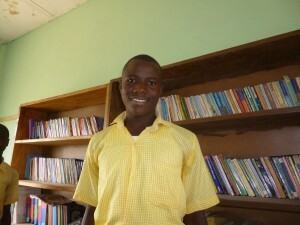 Our 30 pupils in JSS3 will sit their BECE exam at the Methodist High in June. We have to pay one terms school fee per child for this accommodation, Le 35,000, in the region of £130 in total. This is not an expense we were expecting. Primary School exam centres are free. However, we have only just learnt that only the Primary sector is subsidised by the Government. At this late stage, the cost will be met by OAKS, an expensive lesson learnt, next year the parents will pay! Friday gave me the opportunity to observe our new teachers in action. What a pleasant surprise. They all appear to be effective and already have a nice working relationship with the pupils. There was also time for me to start lesson observations with our other staff. A hectic few days. Friday evening saw a visit from our mining friend Sam with his rather grown up daughter Aminata, last time I met her she was in Primary and now she’s in Senior Secondary! They were quickly followed by a local builder, Claude and his wife Hawa, to discuss the school progress of their eldest son Paul. Saturday was a day off! A lazy morning reading. At 2pm I was back at school for the inauguration of our Local Chief, Mike Baio. Mike is a recently retired teacher and also the chairman of OAKS School Management Committee. 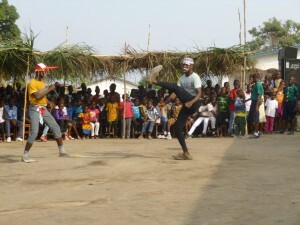 Sierra Leone Clowns. The one with the large sunglasses and the flippers on his feet has a daughter in OAKS Primary. Local native dancing entertaining at the Town Chief’s inauguration. Venue OAKS School playground. The playground had sheltered ‘baffas’ erected and furniture arranged for the event. Quite a programme of speeches, singing and native dancing. 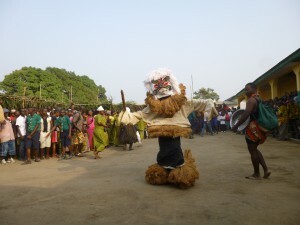 Many local dignitaries attended, including Tikonko’s Paramount Chief. I left after all the formalities at about 7pm but the party was in full swing until dawn! I settled down to watch the film Amistad. A gritty slave trial set in the United States court system pre American Civil War. Based on a powerful true story about the West African slave trade via Sierra Leone. Excellent cast – Morgan Freeman, Anthony Hopkins, Mathew Conaughey & Djimom Hounson. Senge Pieh, 1813 – 1879 was the slave leader & spokesman for the group in court, his place in history is celebrated and remembered with his image appearing on the Sierra Leonean currency, the 5,000 Leone note (£0.65). Sunday was spent auditing the books. A chore best dealt with right away, allowing time to resolve any problems. Fortunately as usual very little to cross check or query and quickly resolved on Monday. Late afternoon there was a little light relief, our local builders popped in to say hello, Lawrence and Mustapha have built OAKS House and constructed our two new classrooms in 2013 and 2014. Most of my following week seemed to be consumed by paperwork, collating information, statistics and resolving various issues arising from employment, time tabling, repairs, school intake, examinations and the extra tuition required purely to resolve the reduced lesson time constraints of a two term school year. 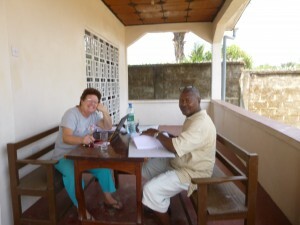 OAKS House veranda with Rey Jarrett, the school bursar. All bookwork thoroughly checked. The analysis of the time table showed a great inequity in staff free time. In the Infants sector there were staff with no free time at all whilst higher up the school some had as many as 15 free periods! Class 1, also did not have enough cover. Five years ago we agreed that Class 1 was such a high priority that we assigned a teacher and a classroom assistant. 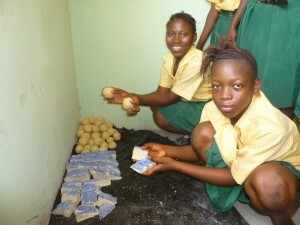 With expansion, Isata their Class teacher and our only Home Economics specialist, she has been called upon to teach her Option subject to Class 5 through to JSS3. 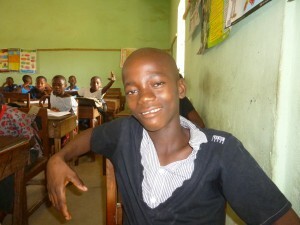 Classroom assistant Max, because he is studying to become a teacher via Distant Learning is due to qualify this August, so, he has been given the experience of teaching in other classes, Class 4 and Class 5 as well as Class 1. What a juggling act. Hopefully staff ‘free time’ is now sorted. The Head teacher has had his contact time reduced, the Infant staff now have some free periods and Class 1 is well catered for. All is not equal, but it is much fairer than it was. Time to get to know some of Junior Secondary School. Notice the uniform innovation the pupils have chosen to distinguish JSS3 from the other JSS classes – long sleeves and a green bow, very smart. . I conducted a few mini interviews with JSS 2 & 3. How do they feel about OAKS and what are their hopes & aspirations for the future? Vandy, JSS 2. He loves OAKS and would like to train to be a doctor. Satta, JSS3. 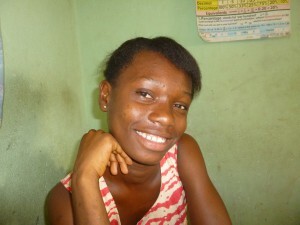 She wants a career in commerce and to become a Bank Manager. They are very ambitious. Obviously aiming for careers with good job prospects and a reasonable wage structure. No takers for teaching!! Friday was a break from paperwork, time to sort the library. It is the dry season and everywhere is very dusty. We have had some donations of books which were shipped out from the UK courtesy of St Anselm’s in Birkenhead. However, I am conscious of two things – there are no books suitable for beginners and all books have a very western theme, rather alien to the African culture. However, perfect for reading practise. The library is really only suitable for Class 5 upwards. It will probably not be used properly until the next school year when we are back to three terms and the pressure to cram the curriculum is not so great. Friday afternoon was a great change for the pupils, a football match, Class 6 & the Newcomers v Junior Secondary. A closely fought game, the final score a draw, 3 all. The Home Economics department enjoyed a practical lesson whilst the game took place, grilling fish on their charcoal burners and serving it with a pasta salad. Smelt and tasted divine. Lucy Kposowa led her CPA (Creative Practical Arts) group JSS2 in the making of soap, utilising the ‘Option’ room, during the match. Fascinating procedure and an easy way to make some extra household income in the future, for our pupils. I’ve brought back soap samples for Nic & I to try! Friday night in the House compound, all the children, seven or eight in total piled in for a screening of ‘Finding Nemo’. Went down well, despite there being no pop or popcorn. Saturday afternoon I’d arranged to meet Joe the Head and Moses the Chairman of the Parent/Community Teachers Association. We walked up to the land owned by Nic and Margaret, known as the 24 Town Lots (a town Lot is 70’x80’). Moses & Joe viewing the scale of the clearance job. Note all the development in the background. We strolled around the perimeter looking at the amount of vegetation and discussed how it could be cut down and burnt ready for May. An area has been cleared by the local youth, it’s used as a football pitch. The foliage cover varies considerably across the plot, the bottom area which is a little swampy is extremely overgrown, it hasn’t been cleared for years. The OAKS parents want to use a large portion of the 24 Town Lots for Sports Day 2017, this is incredibly important to them. Due to Ebola there have been no sports meetings since early 2014. The only way to explain its importance is to compare it to Christmas; it’s like Christmas times 5!! 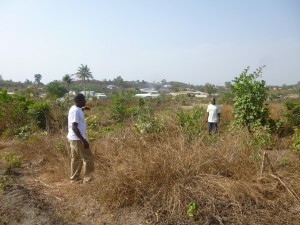 Nic is keen for the whole area to be cleared so he can survey the land, to consider further and future development. The whole of Bo is expanding apace. Our area in Mendewa used to be mostly bush land, it’s now being rapidly cleared and farmed and then built on. Our school is no longer big enough to serve the Community. In our area there is a small private Primary and Junior Secondary school plus two very small Muslim Primary schools. There is no Senior Secondary School in the vicinity at all. 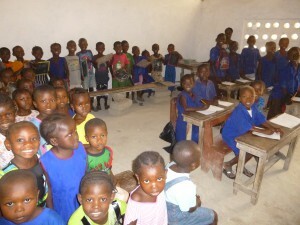 Children have to travel into Bo itself, where those facilities are bursting at the seams. On the way back home from the ‘Twenty four Town Lots’, Joe took me to look at Ebic, a school close to us. Our Primary charges Le 25,000 per term (£3), their fee is Le 100,000 (£12), we are both a lot cheaper than the big Private Schools whose fee are in the region of £100/ term. Ebic is a work in progress, classrooms are bare block, there are no ceilings or internal doors, it certainly makes OAKS look quite palatial. On top of school fees, OAKS parents with a child in JSS 3 have agreed to the following extra costs: Digital registration for each pupil Le 25,000, Mock paper Le 20,000 and Extra tuition Le 40,000 – a total of Le 85,000 (£10.50). Parents with a child in Class 6 have agreed to Le 15,000 for Registration and Le 30,000 Study fee, total Le 45,000 (£5.50). It does not sound like much, but these are difficult sums of money to find for many of our parents. 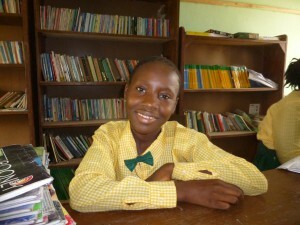 Rita, 12 years old, Class 6, wants to stay on at OAKS for Junior Secondary. Nat, Class 6, aged 14. Moved from his village to live with grandpa. Would love to stay at OAKS for a good education. My final week was very mixed. Thursday was suddenly declared a public holiday, this was great, a lie in and then the rest of the day producing mini biographies for OAKS staff and some of the pupils. Tuesday, our new teacher Mr Sandy had requested I do a demonstration lesson, a double lesson! Grammar & Essay Writing. The grammar was difficult, ‘Question Tags’, basically rhetorical questions, if the statement is positive then the question is negative and vice versa eg: We’re going out at 7.30, aren’t we? Planning was challenging. He marked me according to a ‘Lesson Observation Format’ I’d given him. I scored reasonably well, although marked down harshly for my inappropriate sentences for an African culture!! A good exercise, we both learnt something. I completed my lesson observations and really enjoyed working with all of the classes. It’s wonderful to work with children who show such enthusiasm and genuine appreciation for whatever you do for them. They’re very polite and smiley. Such a buzz! Friday evening 4pm was a CTA or parent’s meeting. OAKS school hall. Vibrant meeting with parents. We managed to start reasonably promptly and the hall steadily filled with parents. We had to move our table backwards twice and send for more chairs. In the end it was a very well attended evening. Parents are very vocal and strident in their opinions. Eventually the meeting concluded at 7pm. The main event was the discussion of the clearing and burning of the 24 Town Lots. It was resolved that they, the parents, would clear it all. The CTA would use the money OAKS Board was prepared to advance, to pay the physically capable parents and they would share the work between them. We wish them well. Saturday morning, school was very interesting, all the classes were represented, except Class 1 and Class 4, all engaged in a variety of curriculum activities. I particularly enjoyed the maths. Mathew with JSS3. Saturday morning extra maths class. New teacher Mathew Yamba explains well and easily allows pupils to declare a non-understanding of process, he just repeats more slowly and considers if there are smaller steps which could be introduced to assist understanding. They were engaged in the formula to find the area of a triangle. 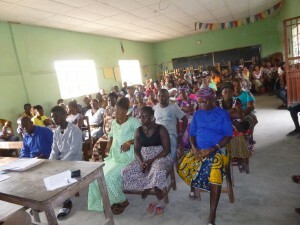 There was a parallel Community meeting in the school hall for the local men that morning too. Bo is experiencing a crime wave, a particularly unpleasant group are moving around the main area of Bo. Mendewa is organising its own neighbourhood watch under the supervision of a local policeman. There is now a vigilante patrol each night in the small hours, each household has contributed Le 10,000 (£1.25) to support the patrol volunteers. It is hoped this scheme will completely deter. I had a deputation from a group of pupils in Junior Secondary 3, they called at the house at lunch time. They belong to OAKS ‘Kid’s Club’ which was started in 2014. They want to be registered with the Department of Social Welfare, Gender and Children’s Affairs so they can apply to World Vision for sponsorship. The Committee. Deputation from the Kid’s Club. 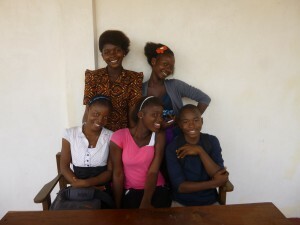 They meet after school on a Thursday each week for an hour and discuss and debate topics of their choice which affect them, such as the local environment, teenage pregnancy etc. This club is open to anyone at OAKS. They have a constitution, a committee and their motto is ‘Voice for the Voiceless’. They were a little miffed that Scouts are getting all of the attention. They too would like a uniform – just a bright yellow polo shirt with the school logo and the name of their club. Uncle Nic will have to look for some sponsorship! At 2pm I was back at school for the investiture of the Scouts. They each received their ‘World Scout Badge.’ Five scouts from the local organisation carried out the ceremony, it was fun. 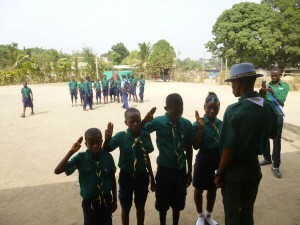 Scouts receiving their World Badge & reciting their Motto. Teatime, 5pm, I was collected by Mohammed ‘the bike’ and taken via Honda to meet Local Town Chief Mike Baio in Bo at a bar/disco called ‘After Work’. A most enjoyable couple of hours chatting to a few teachers from the area. Only two beers, a third and I would have fallen off the bike on the way home! Saturday evening it was a treat for the children of the compound, we watched ‘High School Musical 3’. Alusine, 4 years old, more or less slept through it all, the other kids thought it was great fun. Sunday I had another visit from Sam the mines inspector. He hopes he will receive a good promotion in the next round of improving and updating the mines inspectorate. My last day. I’m the ‘Happy Snapper’, lots of photographs. Mid-day – 2pm we had a staff meeting, gathering together all the threads from my visit and planning ahead for the next one. What new things to be addressed? A rather sour note. Francis Rogers, teacher of Agriculture and Social Studies, was not in school for my last day. He had a severe altercation with a female neighbour, she totally trashed his house, assaulted and robbed him. He came to school to explain and to apologise for his absence before he returned to the Police Station, I have to say, he really looked dreadful. We wish him well and hope the affair is sorted. Tuesday, up early and rang Francis. He has an appointment with an important police officer at 10am, he certainly sounded a lot better and more positive. 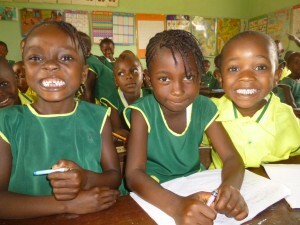 Lagor pupils, Class 1 & 2. Not much classroom furniture. Primary, they have been in receipt of a grant from The Kitchen Table Charity, John Humphries, Radio 4. Found it …. It was down a narrow dirt track about a mile and a half inland from the Highway. Three teachers in charge of 150 children and only two of them salaried – we really don’t know how lucky we are in ‘The West’. Perhaps on a future visit we could offer them some small amount of practical help. It was an easy journey to the airport, it took about four and a half hours. Lungi Airport Departures has greatly improved, sailed through booking in and security. 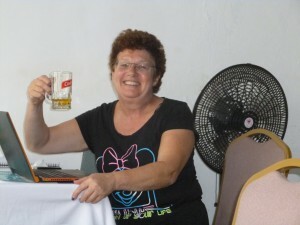 Sitting finishing my report and enjoying ‘a cold one’! Restaurant at Lungi Airport. Cheers! Flight due in three hours. Arrive in Brussels at about 5.00am, Manchester late morning and home for lunch. Time to catch up on domesticity and farming with hopefully a little teaching thrown in …….. need to finance my next adventure. Laurel. Tuesday/Wednesday 23rd/24th February 2016.